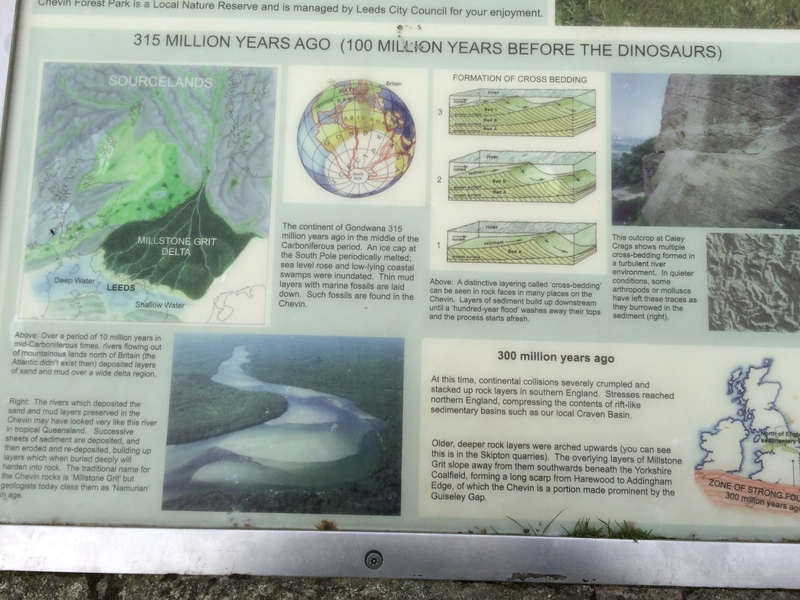 I visited the area around Leeds recently, and came across this sign [pdf] by the Leeds Geological Association, on the Chevin. The Chevin is a ridge in the West Yorkshire landscape, formed over thousands of years. The surrounding area is mostly a valley (one of the “dales” of the Yorkshire Dales) formed by prehistoric rivers and glaciers. I wasn’t expecting to encounter any science on this trip, so the geology sign was a surprise. Fittingly, I found it at “Surprise View”, the highest point of the Chevin. This entry was posted in Have Science Will Travel, Uncategorized and tagged Chevin, Leeds, Leeds Geological Association, Yorkshire, Yorkshire Dales. Bookmark the permalink.